The definition Rational drug therapy is the use of drugs, which are efficient, safe, low-cost and easy to administer. It requires that health practitioners have adequate medical knowledge and appropriate skill for correct diagnosis and treatment. Rational drug therapy one of the major part in treatment to give accurate treatment to patient. It is very important for underdeveloped and developing countries, not only these both it is important factor too developed countries. The rational drug therapy should be followed in each and every treatment it gives efficacy and effective treatment to patients and common people. The common people sometimes fallow over counter drugs (OTC) it is an unrationalised way not only OTC but also doctor prescribed treatment. Rational drug therapy shows main impact on treatment duration of patient and healthy life common people. The study was mainly done on common people to know about rational drug therapy procedure, how much knowledge about rational way of treatment and drugs intake. This pattern of study is about how much they skipped doses and treatment taken on which references. The patient and people how they misuse the drugs for their treatment. The survey was conducted on all common people who are educated persons and present in the social media or using social media. It is an online survey, we send our questioner’s through Online link to one thousand members. The data was collected in the form questioners. The study was conducted on common people which includes all ages and professions. We are share the activated link to one thousand members in that 787 members are open the questioners in that 632 are filled and submitted to questioner’s, rest of them are not responded to our questioners. 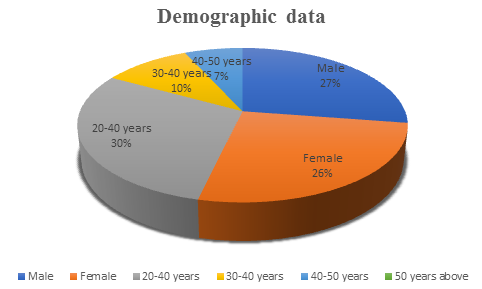 In that women are 300 and men are 324 members are replied to questioners, with respectively following ages 348 people are in the between 20-30 years, 120 people are 30-40 years, 80 people are 40-50 years and 21 members are more than 50 years above. 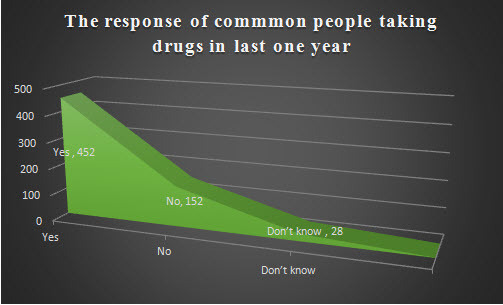 In last one year 452 people are taken, 152 are not taken rest of them 28 they don’t know whether they taken drugs are not. The recommendations are 204 selves Over the Counter Drugs (OTC), Doctor prescription are 232, Both Doctor prescription and OTC are 188 and others recommendations. 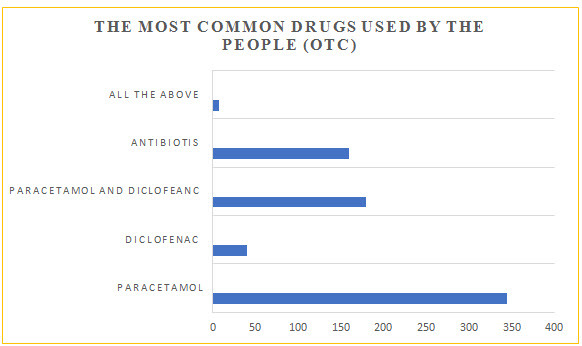 The most commonly used OTC drugs are Paracetamol 345-members, Diclofenac 40-members, Antibiotics 160-members, all the above drugs 80-membersare used and any others drugs used 7-members. Figure No. 1: showing demographic details of common people who are in the part of survey. Figure No. 2: Showing the results of how many members are taken drugs in last one year and how many are not. Some people are they don’t know about whether they taken drugs are not. Figure No. 3: Showing the results, the response of common people on Rational Drug Therapy, the medications are taken by Over the Counter Drugs (OTC). Figure No. 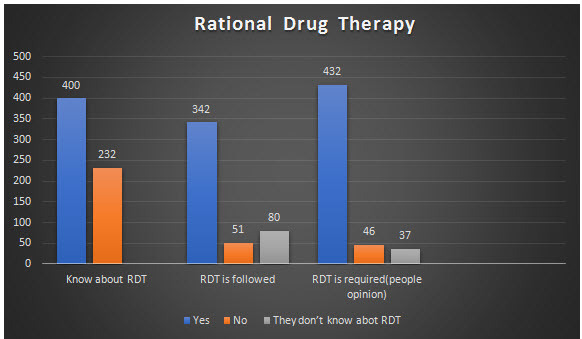 4: Form the data we can easily understand how many members know about Rational Drug Therapy, how many members fallow the Rational Drug Therapy (RDT) and how many members are supported to requirement of Rational Drug Therapy (RDT) in treatment. In these studies, we can easily understand the requirement of rational drug therapy in every treatment. There are several mistakes are done by the people or patients in their treatment (skipped doses), The over the counter drugs (OTC) drugs are taken by the common peoples for common illnesses it leads to many complications to common peoples, so we have to conclude that to minimize the errors in treatment (Health care system) better to follow rationalised way of treatment should me needed. We can see the results majority of people recommend or preferred for rationalized way of treatment or Rational drug therapy. These types of studies are improving health care system and minimising the errors. 1. Amanda le grand et al .Management Sciences for Health. Managing Drug Supply. West Hartford, Connecticut, USA: Kumarian Press, 1997.HEALTH POLICY AND PLANNING 14(2):89-102. 2. Feely J, Coakley D. (1990) ; Altered pharmacodynamics in the elderly. Clin Geriatr Med ; 6(2) ; 269-283. 3. Gurwitz JH, Avorn J. (1991); The ambiguous relation between aging and adverse drug reactions. Ann InternMed ; 114(11) ; 956-966. 4. Hanlon T, Schmader KE, Koronkowski MJ, et al. (1997) ; Adverse drug events in high risk older outpatients. J Am Geriatr Soc. ; 45(8); 945-948. 5. The Rational Use of Drugs: Report of the Conference of Experts, Nairobi. 1985 11 25-29 Last accessed on 2015 Dec 15. Available from: http://www.apps.who.int/medicinedocs/documents/s17054e/s17054e.pdf. 6. Turkey Rational Drug Use Bulletin. 2015 Last accessed on 2015 Nov 13. Available from:https://www.titck.gov.tr/PortalAdmin/Uploads/Titck/Contents/Documents/6d…. 7. Teacher’s Guide to Good Prescribing. 2001 Last accessed on 2015 Nov 10. Available from:http://www.apps.who.int/medicinedocs/pdf/s2292e/s2292e.pdf. 8. World Health Organisation. Rational use of Medicines. Available at http://www.who.int/medicines/areas/rational_ use/en/index.html ; 2010. Accessed 14.01.12.